So, the Nester has been talking about fake flowers, plants, etc. for the last week and today is having a P.O.O.P.I.E party (People Opposing Objectionable Pretend plants In the Environment) I've heard Nate on Oprah say fakes are a no-no, and on HGTV they just featured the Top 25 decorating mistakes and guess what #1 was?? Using Fake Flowers. Well, I don't think I have any flowers, but I am such an offender! I have a ton of fake stuff in my house, and as I was looking, I think I have a berry obsession that I may need an intervention with. Yesterday and today have been cool and in the 60's, so I broke out the fall stuff! Let's take a look at my fakes, scattered with a few real. Fake crow (these crows are so cute. Pottery Barn has some of these same type of crows for $24. These are $1 at the Dollar Tree!! 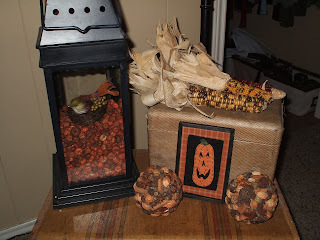 If you want to see a really cute idea to use them, look at what Susie did) fake berries, fake pumpkin Fake crow (dollar tree! ), fake pumpkin, fake berries. 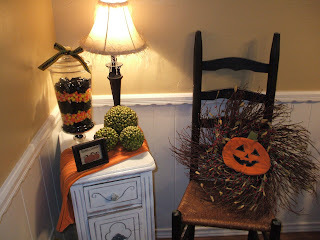 I have to tell you that my mom found these pumpkins at Michaels one year at Christmas for one penny each! Can you believe it? The pip berry garland I got at a yard sale this summer for $1. So, the whole ensemble was $2.o1. REAL candy (could you ever have fake?) I put the black licorice on top because guess who is the only one who likes it? Me. Can anyone help me think of some fun green candy to put in the middle between the candy corns? One that I wouldn't have to buy a million packages to get enough green? Fake green berry balls, fake berry wreath. Up top is some of the ivy that is objectionable. It gets soooo dusty. See that cute candle holder? Dollar Tree with all the Halloween stuff! Fake apples ~You should see the tiny bites in them now from my 18 month old! 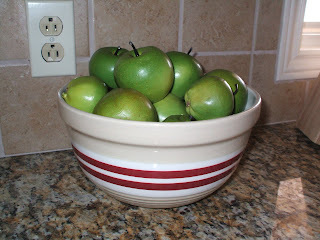 I promise I do buy real apples, I just don't keep them on a bowl on the counter. The plant by the computer screen is REAL. But guess what? It's starting to turn brown. That's why I am more of a fake person on the inside of my house. I would never put fake flowers or plants outside, but I think they're okay inside as long as they don't look *too* objectionable. :) What do you think? Do I need to go to Fake Berry Lovers Anonymous? Should I ditch the ivy on the top of my shelves? You have a beautiful house and your children are darling. Good luck on #5!! 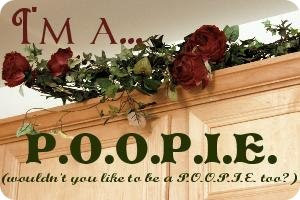 Love your "poopie" arrangements. Those are great pictures! I like your style! 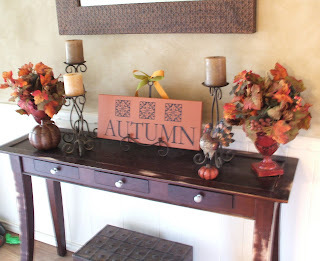 Your fall decor is wonderful! Could you maybe go to the bin at the grocery store and find a green candy? Maybe green hard candy, can't think of the name of them...sour apple flavor...used to eat them as a kid. And the apple would go with the fall theme. Nice work!! I bet your kids love how fall your house is! 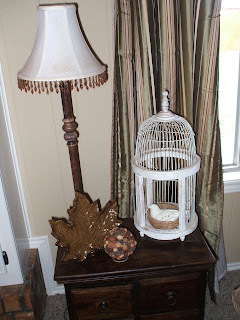 Loved your fall decor and you didn't need any fake florals to have a gorgeous house. Nate would likes yours! 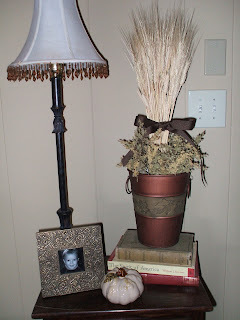 I would fail the HGTV list of the 25 biggest mistakes when it comes to family photos and and fake plants. It was nice touring your home! Wow, all your fakes are so beautiful and your children are so adorable. I'll be watching for your sweet new one! Love all your fakes! The fall stuff you've done looks wonderful. Melissa, ANYTHING you do is classy. I don't care what anybody famous and rich says about it. Love you! And thanks for the help on my window mistreatments! Your house is beautiful! 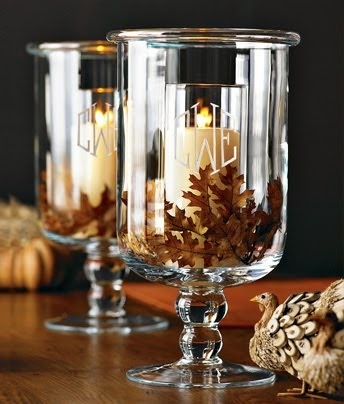 I love the fall decor! As far as your green layer goes, I wonder if you could find some miniature plastic green apples. Food for thought...but not for tasting...eeewwweee...plastic. Hi, thanks for your sweet comments. the paint in my kitchen is Mexican Sand SW7519 by Sherwin Williams. I've not grown tired of it after many years. Not too dark but a great contrast with white woodwork. 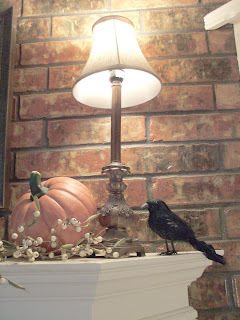 oh, i adore all the great autumn touches- you did good! but really, the DEALS gave me heart palpitations. really. i really, really appreciate a good deal. wow! I love everything you've done. It all looks great!! I've seen those glass apothecary jars on several blogs... where are you all finding those? I want some. I like all you fakies! My fav is is the bird in the tiny pumpkins. They remind of this berry/weed bush here that has them. Very cute. Also like the candy corn and licorice. May have to steal that one! I don't EVEN know WHERE to begin with all the compliments...omg!!! Can I come live with you?? I SOLEMNLY PROMISE to leave ALL my POOPIE's behind, if you would just let me come to live with YOUR POOPIES!!! Honestly! I was quite impressed...I now have ONE MORE PERSON to watch out for, and grab ideas from! Thank YOU! So glad I found you in Nester's Poopie Party!!! 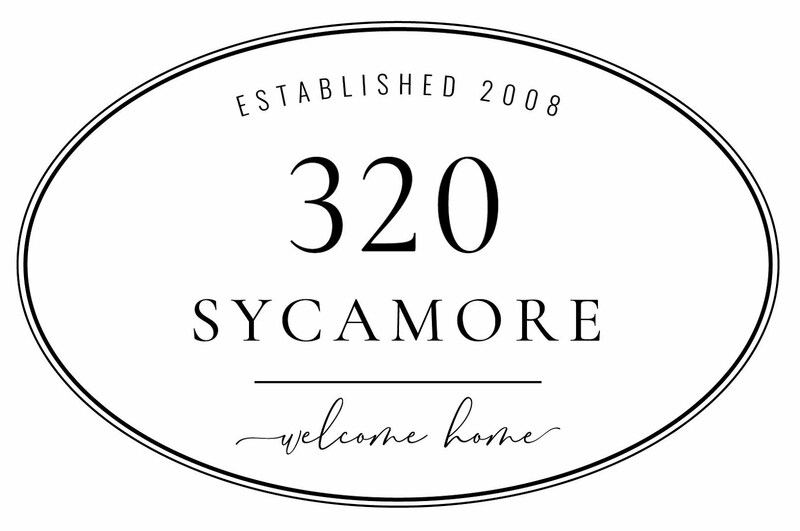 Thank you soooo much for commenting on my blog, and after going BACK to your blog, I realized we may be "sisters" in our needs and likes and wants, far more than we know it!!! 1. 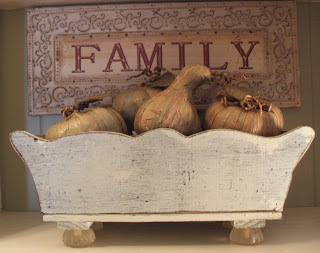 I gots me a scalloped container, in BLACK CRACKLE, but not enough gourds to fill it, yet! 2 & 3. 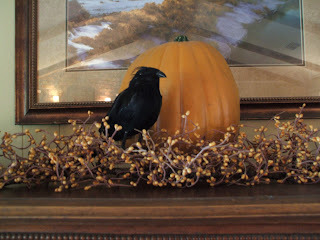 I gots me a few punkins and I definitely gots the "tallowberry" berries...going to find me some cheap Crows, tho. 4. 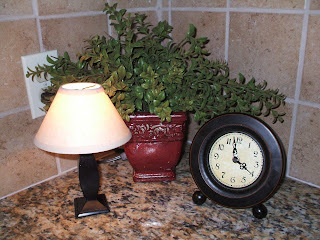 I definitely have the same SMALL LAMP OBSESSION, that you have...I just don't show them all! Should be the NEXT contest, huh! 5. 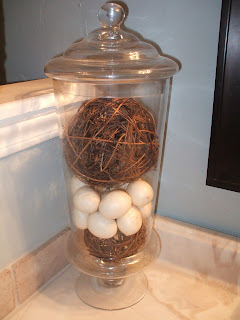 I LOVE the putka pods, but I mixed mine into potpourri and fixins, and then set all that into a long long box on my coffee table, and inserted jar candles into that...and I love those ball thingies...Might have to make some of those for myself! 7. I've got viney balls, too...smaller and bleached. 9. I use books all the time for height and just to bring in color...cover them with wallpaper scraps if I don't like the colors or the bindings. 10 & 11. 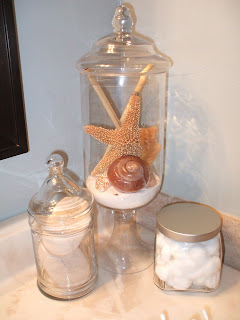 I gots to do these bathroom jars...I saw them somewhere else and loved them, and it looks like you have that same theme I am going for, if HGTV POLICE don't arrest me first, for THEME ROOM VIOLATIONS! What COLOR is that on your walls??? LOVE LOVE LOVE IT! 14. 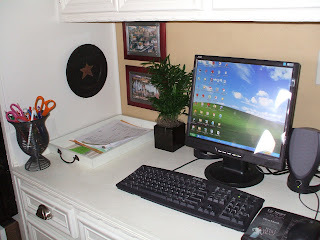 If my computer area looked THAT good, I would have me a SPECIAL plant, and a FAKE one at that! Something totally SPECIAL to draw inspiration! 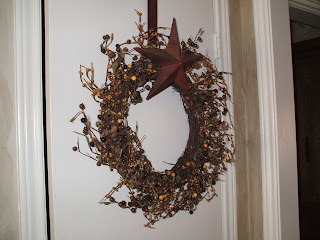 15..Where on EARTH did you find that wonderful Wreath Hanger? Did that Star come attached to it! Oh please say you did this yourself!!! Thanks for letting me be so wordy, and by the way, I added you to my FAVORITES BAR...accessible at all times! I have to say, your blog is the best one I've seen! Your house looks beautiful and the decorations, well the decorations are amazing. I just " happened" upon your blog but I'm so glad I did. If you don't mind, I'll be adding you to my blog list so I can continue to check in on you and your precious family. 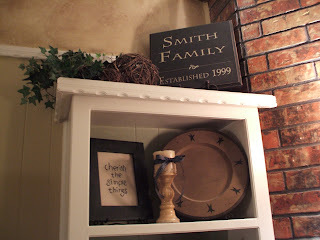 Thanks for the decorating tips and ideas! I love your decor-fake or not. I am a fan of fake in the right places. I love berry garland and pumpkins and such, but I agree I would never put fake outside.